After a lengthy discussion that involved multiple struggling fire departments within SLO County, the Board of Supervisors unanimously voted at the March 13 meeting to aid the Cayucos Fire Department if it dissolves. "We're faced with the reality that it is our obligation on a number of different levels to provide this service because we know the Cayucos Fire Department is going to dissolve," 2nd District Supervisor Bruce Gibson said at the meeting. URGENCY Fire departments throughout San Luis Obispo County struggle to stay staffed and fund their services. Cayucos filed an application to dissolve with the Local Agency Formation Commission (LAFCO) in September 2017. In October, the county requested that LAFCO put the application on hold to allow the board to discuss the district's proposal. Staff presented the board with four options should the Cayucos Fire Department dissolve and the county take over: provide full-time year-round staffing at the current fire department, provide three-person staffing with the Fire Prevention Office at Station 11 (Cal Fire), provide two-person staffing with Cal Fire at Station 11, or close station 56 altogether and have response from stations 10, 11, or 12. The first three options would have the county staffing the department through its contract with Cal Fire. 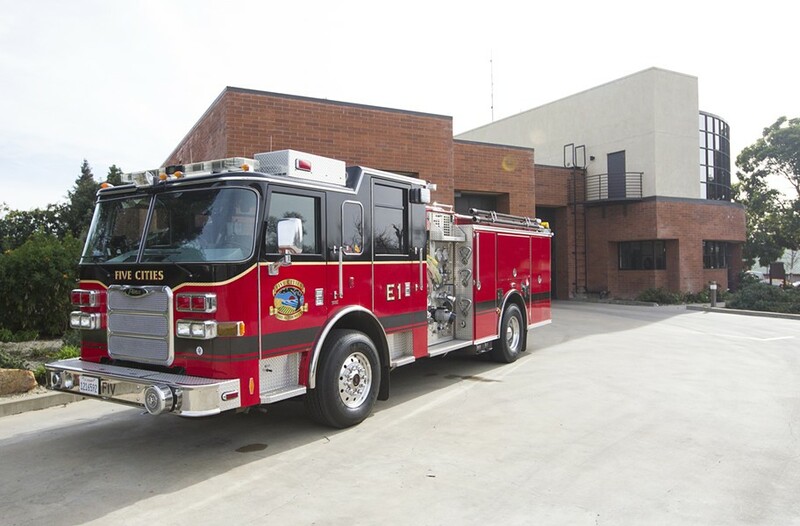 The board unanimously voted to fully staff a structure fire engine at the current fire department at an annual cost of $912,000—the county would also pay for necessary upgrades at the station. The discussion opened up the larger issue of several fire departments in the county that can't meet staffing requirements because of a lack of funding. In South County, the Five Cities Fire Authority is currently working with its communities—Arroyo Grande, Grover Beach, and Oceano—to possibly end its reserve program and hire three full-time career firefighters. The transition is estimated to increase the fire authority's budget by 70 percent. At a March 13 meeting, the Arroyo Grande City Council discussed whether there would be enough funds to hold up their end of the joint powers agreement with the agency. "The harsh reality is we cannot—not because we don't want to. We just have to live within our means," Arroyo Grande City Councilmember Tim Brown said. For the 2017-18 fiscal year, Arroyo Grande spent $2 million on fire, Grover Beach chipped in $1.4 million, and Oceano put up $808,530. In North County, the Cambria Fire Department and Templeton Fire and Emergency Services Department face similar issues. Cambria residents will vote in June on a tax per parcel owner that will pay for three full-time firefighters. The proposed tax would generate $378,000 a year. Templeton doesn't have the money to operate 24/7, and is only guaranteed staffing between 8 a.m. and 5 p.m. Fire Chief Bill White started Friends of Templeton Fire and Emergency Services, a campaign to raise awareness and money for the department. All of these issues were mentioned during the meeting by the board of supervisors and public commenters. The board also voted to direct staff to start a blue-ribbon committee to assess future fire protection needs countywide.